Troy with son, Cole, and catch! 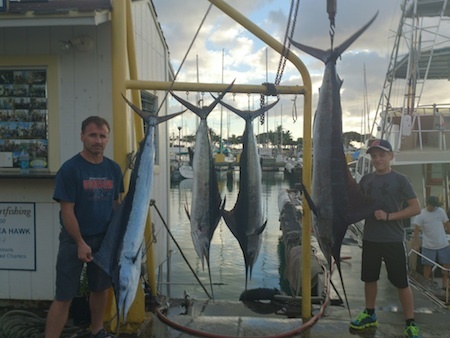 Mahalo to Troy and his son Cole for choosing Maggie Joe Sport Fishing. 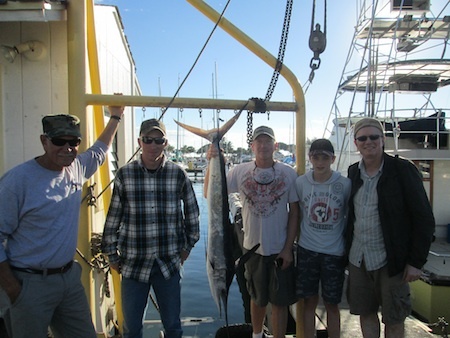 They joined Captain Mark aboard the Maggie Joe on a sport fishing charter. 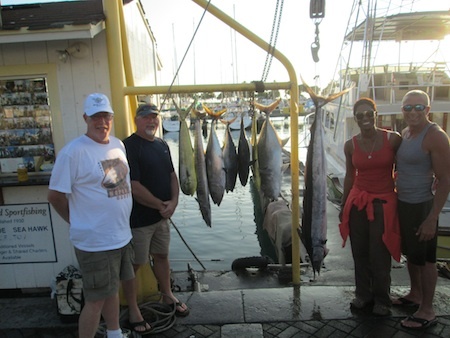 They hauled in a Short Billed Spearfish and 3 Striped Marlin’s while deep sea fishing off Honolulu, Oahu. Aloha! Nicole, Davin and Raymond with 3 Spearfish! 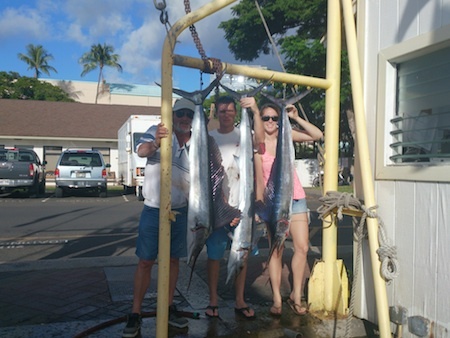 Mahalo to Nicole, Davin and Raymond for choosing Maggie Joe Sport Fishing! 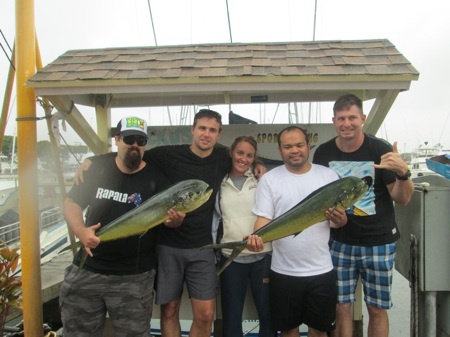 Captain Matt helped them haul in 3 Spearfish while deep sea fishing aboard the Ruckus. Aloha! Matt, Dan, Jeremy, Granden and Ky with their catch! Big Mahalo to the guys for choosing Maggie Joe Sport Fishing! They hauled in a 65 and 50 lb Ulua along with a 35 lb Striped Marlin with Captain Mark aboard the Maggie Joe! Aloha! 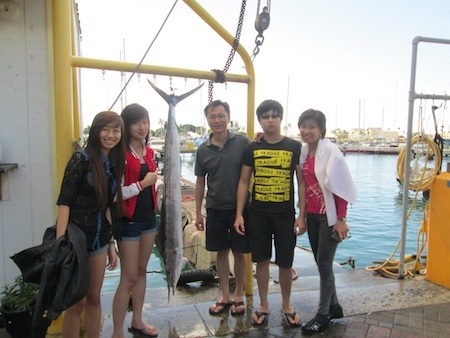 Cheng Ao and Family with their Short Billed Spearfish! Mahalo to Angler Cheng Ao and his family for choosing Maggie Joe Sport Fishing! The family caught this Short Billed Spearfish while deep sea fishing aboard the Rucks with Captain Matt. Aloha! Mahalo to Frank, Tim, Romeo and Raymond for choosing Maggie Joe Sport Fishing! The guys hauled in a pair of Mahi Mahi and Ulua while deep sea fishing with Captain Mark aboard the Maggie Joe. Ernie, Clinton, Ron, Angus and Tony with Stripey! 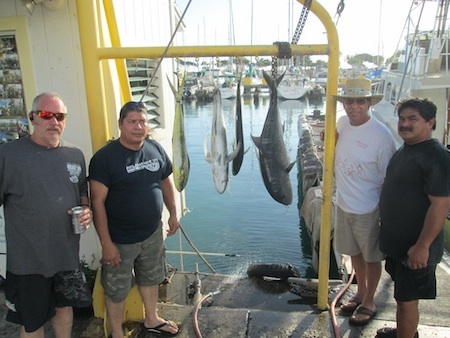 Mahalo to Ernie, Clinton, Ron, Angus and Tony for choosing Maggie Joe Sport Fishing! The guys caught a nice little Striped Marlin aboard the Maggie Joe while deep sea fishing. Aloha! Josh and Family with Spearfish, Striped Marlin and 3 Mahi Mahi! 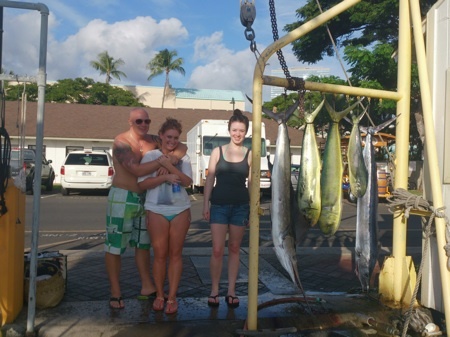 Mahalo to Josh and his family for choosing Maggie Joe Sport Fishing! The family hauled in a Spearfish, Striped Marlin and 3 Mahi Mahi while deep sea fishing aboard the Maggie Joe with Captain Mark. Aloha! Dan, Roy, Vince and Andrea wtih their catch! 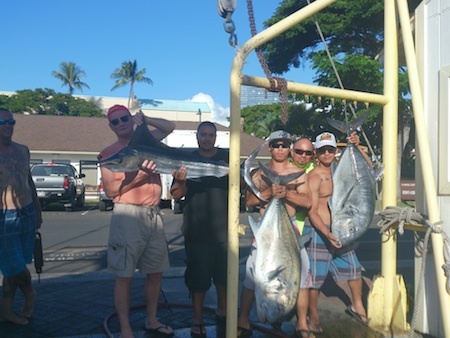 Mahalo to Dan, Roy, Vince and Andrew for choosing Maggie Joe Sport Fishing! The group hauled in Shibi, Mahi Mahi, Kawa Kawa, Ulua and a Short Billed Spearfish while deep sea fishing aboard the Maggie Joe! Aloha!